Update: The following was first published on January 21, 2013 during the Sundance Film Festival. We're reposting it today to coincide with Escape from Tomorrow's release this weekend, in limited theaters and on multiple VOD platforms. Below you can listen to our conversation with the film's cinematographer, who went into detail about how, exactly, they managed to shoot an entire film in Disney parks without Disney's permission. If you asked someone attending or covering the 2013 Sundance Film Festival right now which films are attracting the most attention, Escape from Tomorrow would likely make their list, but probably not for the reasons you think. The small, low-budgeted tale of a father’s slow descent into madness on the final day of a family vacation at Disney World is unusual, intimate and relatable – something you can tell came from a real personal place within director Randy Moore – and it’s especially memorable for its authenticity, including filming inside both Disney World and Disneyland without Disney’s permission. You don’t technically need permission to film people in Disney World, per se, since thousands of people record home movies inside the parks every day. But technically this ain’t no home movie; it’s a well-shot feature film with a modest budget that premiered at the country’s most influential film festival, complete with a sales agent looking to find it distribution. The chances of Disney allowing that to happen, especially when this is a movie not made on its terms, are about slim to "you’re out of your mind," and so where Escape from Tomorrow goes from here is anyone’s guess (see above update). You can listen to or download our conversation below. You can also read our review of the film here. 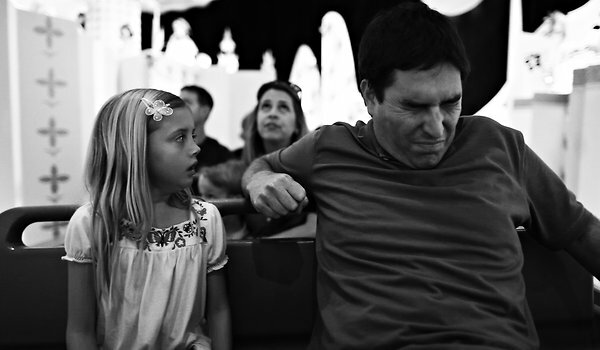 Escape from Tomorrow still has additional screenings at the festival, and you can find out more here.